Dogs may not be prone to cavities as humans are, but still there are a lot of problems they can have. Plaque buildup and gingivitis are some of them, they not only make the dog have bad breath and yellow teeth but just like in humans they can cause the dog serious infection that may lead to big issues. It is important for you to clean your dog's teeth to prevent these kind of problems. 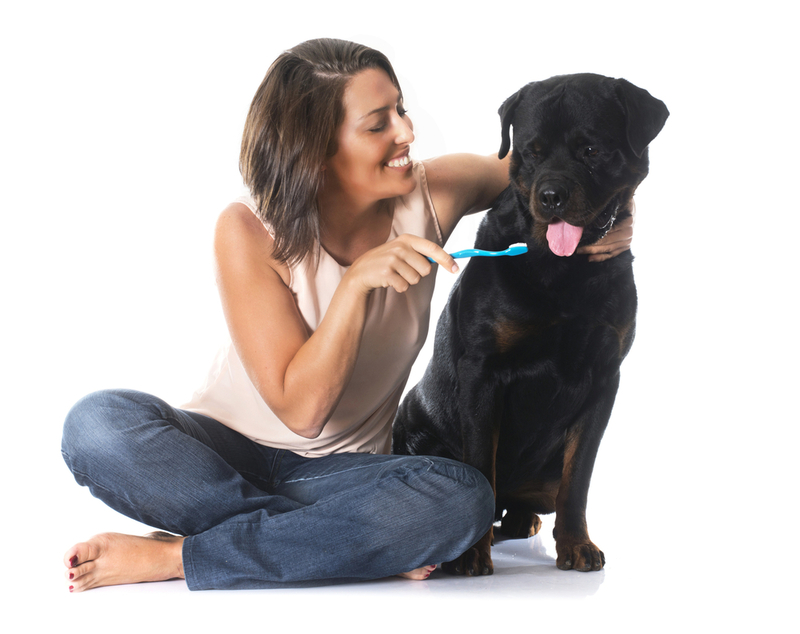 It is important to start at an early age so the dog can be used to the process easly, but you can start cleaning your dogs teeth even if you haven't started when they were puppies. -The first step you should do is, place a little dog toothpaste in your finger and let the dog lick it so he can get used to. -The second step is placing some of the paste in the dogs teeth, repeat this process for several days so the dog can get used with something placed in his teeth. -The third step is placing some dog toothpaste in the toothbursh and just let the dog lick it, reward the dog after this process. -The four step is the final one, you should gently hold your dog's lips and hold the brush at a 45 degree angle to the gumline. Brush each tooth, moving the brush gently back and forth. In the first times brush only several teeth, and start increasing the number in the next times. After the process reward the dog. It is prefered to clean the dog's teeth every day, but if that's not possible at least several times a week is prefered. There are dental care products like chew toys and dental diets that help you provide your dog with dental care. DO NOT EVER, human toothpaste contains fluoride that is very poising for dogs. Always use special pet toothbrush.